Starring: Casey Affleck, Kyle Chandler, Michelle Williams, Lucas Hedges, and more. The dramas are in full force for the awards season of the 2016 film year and another rough and tough contender comes to audiences in the form of ‘Manchester by the Sea’ starring Casey Affleck, Michelle Williams, Lucas Hedges, and more. With quite a number of praise coming from all kinds of sources, it is time to give it the Oberrated review and finally see what all the buzz is about personally. Lee Chandler (Casey Affleck) is a simple handyman living in Quincy, Massachusetts. He gets by day to day doing his honest work and starting the same routine come sunrise. One day, however, he receives a call about his brother whom of which has a history of bad health and Lee must return back to the area of which he used to live. As the story develops, we as the audience, learn that Lee has quite a history in this town and must battle his past demons alongside of his newer demons. Rightfully so, I am going to start this off with ‘Manchester by the Sea’ was one depressing as hell film. Fantastically delivered and performed but my lord, such a sad and tragic story. That is truly what fuels this film though, the performances of such tragically defeated characters just barely making it by but still continue to move forward with life, continuously taking punches, barring setback after setback, and still.moving.foward. Another thing I truly loved about this film was how honest and real it felt. There was nothing Hollywood about this film. It felt like real people with a tragic and believable pasts, experiencing life in an unfortunate series of events. Overall, this may be the most honest film among the Best Picture contenders, in my opinion… To reflect back, I wanted to bring focus to one scene in particular. There is a five minute exchange between Affleck’s character and Williams’ character, and to me, this scene was the absolute icing on the cake when it came to the grief and despair that both characters carry throughout the entirety of the film. This scene made the movie for me. I had chills running through my body and I felt what they were feeling. A truly moving and memorable moment that solidified how excellent of a performance these two had in ‘Manchester by the Sea’. So, there you have it. Boiled down, ‘Manchester by the Sea’ is a powerfully performed, honest, and true film. Nothing happy about it, no giddy and joyous feelings and if there are, it is only for a moment or two. Some humor is thrown in but it is as dry as the characters that are delivering them, which matches the personalities perfectly. A major recommendation from Oberrated but be cautious, you may need to give Pharrell’s “Happy” a few plays after viewing this one. 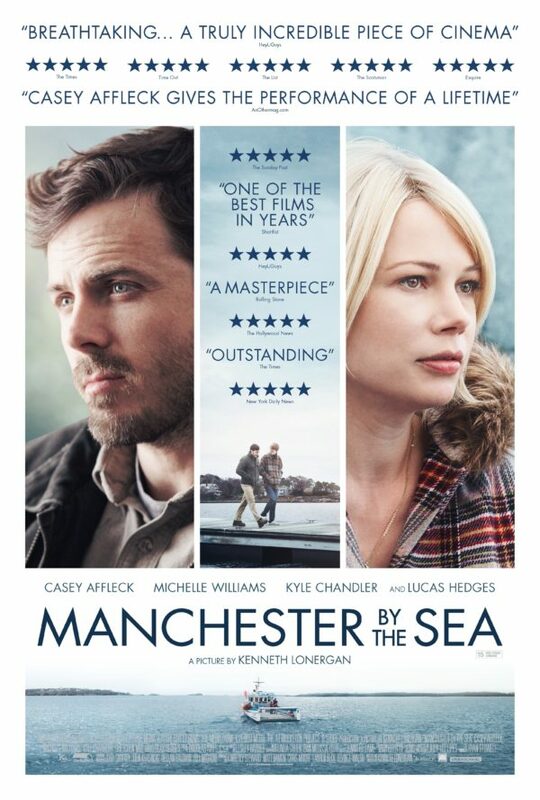 Posted in 2016 Movies, Movie Review.Tagged Casey Affleck, Kenneth Lonergan, Kyle Chandler, Lucas Hedges, Manchester by the Sea, Michelle Williams.